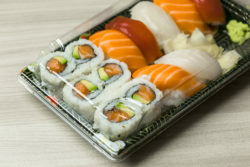 The sushi at Acquistapace’s Covington Supermarket is prepared fresh daily by our sushi chefs. We use the freshest ingredients, always free of preservatives, coloring, and other unnatural enhancers. They hand-select the fish and vegetables they use every morning. The seafood must pass our rigorous standards for quality and sustainability. Acquistapace’s Covington Supermarket has been family-owned and operated for over 150 years. Our business has evolved from a mom-and-pop shop to a supermarket stacked with the finest cheeses, wine selections, prepared foods, fresh sushi and much more. Contact us today with any questions, we are happy to help.